For effective aeration in hoppered or flat bottom storage bins, install Boone Aeration & Environmental full-round or half-round duct systems. All Boone Aeration & Environmental duct is prefabricated in standard lengths for assembly in your vertical storage bins with a complete line of installation hardware. Trained Boone Aeration & Environmental installation crews can handle your whole job or you can install it yourself with our instructions. Based on your bin geometry and grain to be stored, Boone Aeration & Environmental experts will figure your complete aeration needs and ship the entire package for installation at your site. Rugged corrugated full-round steel duct gives high load-bearing capacity. It's ideal for either flat-bottom or hoppered bins and available in 12-inch through 30-inch diameters, in lengths from 6 to 22 feet. 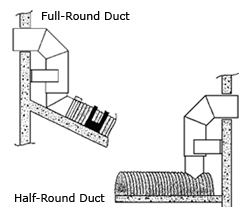 These complete, prefabricated ducts eliminate the need for highly skilled installation crews with all connections being easily bolted rather than welded. For maximum air flow at minimum velocities in deep tanks, install Boone Aeration & Environmental 36-inch half round duct. With high surface area, you can install these rugged 14-gauge corrugated ducts in a limited floor space and get top performance from your aeration fans. With 18 perforations per square inch, you get uniform 13.5% open area across entire duct surface. Boone Aeration & Environmental 36-inch half-round duct comes in easy-to-handle 17 inch sections. They conform easily to your floor irregularities and joined and secured to the bin floor with all seams welded for high strength (bolted assembly also available). For even added strength and stability, we provide angular reinforcement ribs for each section of the duct.